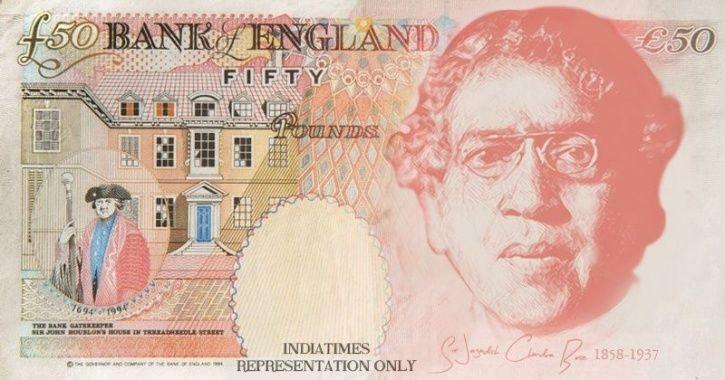 A proud moment for India as the late Indian scientist JC Bose may feature in the new UK 50 pound note. The Bank of England (just like the Reserve Bank of India) had announced that they are inviting suggestions from people to have a new face print on its 50 pound currency. The Bank had received over 175,000 and they published about 114,000 which also features Sir Jagadish Chandra Bose. Who is Sir Jagadish Chandra Bose? JC Bose was a polymath, biologist, biophysicist, botanist and archaeologist. Phew! He was all in one. Moreover, we, today’s generation owe a lot to this man. If it wasn’t for him, we’d not have had the luxury known as Wi-Fi. Sir Jagadish Chandra Bose made immense contributions towards the advancement of wireless communications leading to the development of modern day radio. Without which, there would not be wireless communication nor, as mentioned earlier, Wi-Fi. Though Marconi is widely regarded as the inventor of modern day radio, Bose had demonstrated electromagnetic wave communications a few years earlier. Interesting fact is that Marconi has actually acknowledged the significance of Bose’s work in his writings. With all honesty, the chances of him ending up on the note is very rare but yet, an Indian scientist being nominated to be featured on a UK note itself is a fact enough to be proud about. Wishing Harry Styles a very Happy Birthday!! Are The Brits Drama Queens? These Memes Seem To Say So!